Recently Cat Faeries talked about how our modern house cats live in artificial light which causes them to shed year round. This week we will learn how to get our and our cat’s bodies to produce disease fighting melatonin using color and light. This topic is very important to us because in 2016 we lost two dear Cat Faeries customers to cancer. Cancer among all species is on the rise and rather than talk about causes which we cannot stop or which will take serious collective effort to halt (Fukushima’s ongoing radiation spill into the oceans, and deregulation of US environmental, health and safety laws among them) we will talk about Circadian Rhythm, that 24 hour clock which signals sleep, brain alertness, and melatonin production. If we follow nature’s rhythms which say when one should be in light, what kind of light, and even when to eat, the tools to reduce disease will be right inside every home! Dedicated to Linda and to Judy. Before the invention of artificial light and the industrial revolution, our ancestors and their animals lived in natural light centering their lives around sunrise and sunset. They got up early, were productive, ate dinner early and went to bed early – their evening light was candle light. Most did not die from cancer or other of our common modern diseases. Researchers and doctors have told Cat Faeries that if you don’t eat and sleep as nature intended and follow the cycles of light and dark, we could be courting cancer and other illness. Our feline family members should follow the same laws of nature but they need your help as you control meal times and lighting. The Circadian Rhythm is often called the “body clock” because it tells our bodies when to sleep, to rise, and to eat as well as regulating many of the body’s functions. 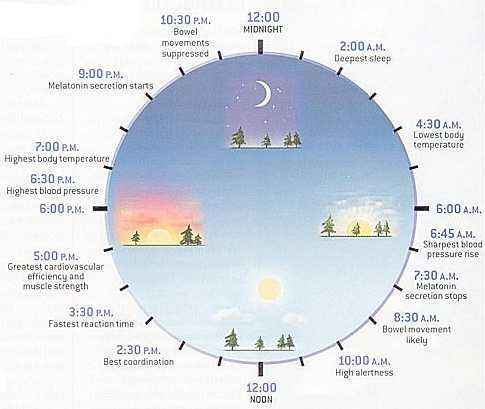 This internal body “clock” is affected by many cues including environmental, such as sunlight and temperature. If a person’s or cat’s circadian rhythm is disrupted, eating and sleeping patterns are thrown off and chaos in the body results. Research is being done on adverse health effects to these disruptions which include heart attack, Diabetes, cancer, obesity, psychological problems like aggression, depression, bipolar disorder, psychosis, and other mental diseases. Our bodies need the two extremes of time spent in light and time spent in dark to be healthy and disease free. We need the bright light of daylight hours which naturally contains all of the colors of the spectrum to give us the energy and brain power needed for the day. Our brains are awakened by this light which supports specific body functions. The light from the sun has a full color spectrum which includes blue. In contrast, darkness contains the full color spectrum with the omission of blue. The absence of blue around us at night triggers the person’s or a cat’s body to manufacture its own melatonin which is our body’s main and natural anti oxidant – a crucial disease and rapid aging fighter. When the sun sets the darkness with its absence of the color blue activates melatonin which begins to flood the blood stream. If we turn on artificial lights which contain the daytime color spectrum, which includes blue, or we stare at computer screens, we prevent our bodies from producing cancer reducing melatonin. Blue light also causes insomnia as melatonin is a sleep hormone produced by the pineal gland in people and felines. We need to produce melatonin, not suppress it as proven by science happens when we are surrounded by blue containing lights at night. If we compare the high rates of cancer, diabetes and other diseases of today to those of the distant past the numbers make a profound statement. Since your cat lives with you and is bound by your schedule you could be inadvertently harming your cat. Melatonin reduces the four most common diseases affecting our modern house cats: kidney failure, hyperthyroid, cancer, and diabetes. Don’t we all joke about how much our cats sleep? But what if we didn’t realize that our modern habits disrupt our modern house cat’s true sleep cycles to the degree that they are now not as nature intended. And what if our artificial lights at night are causing the four most common diseases in cats? Much research and documentation is to be found about the positive healthful and even curative effects of melatonin on the four most common diseases which affect our cats. Cat Faeries feels after reading countless studies that it’s because of blue emitting artificial light at nighttime. You’ll see in this article this is very easy to correct. We wondered about a cat’s eye which has an inner eye lid, and if it might act as a screen for blue light, but not enough tests have been done. It’s important to note that light is also absorbed through skin so our house cats could be absorbing blue light at night time when the cat isn’t sleeping with closed eyes. At Washington University rats with tumors were injected with melatonin rich blood. The tumors shrunk. A group of nurses were studied for 20 years. Half of them worked daytime shifts, and the other half worked the night shifts. Far more of the graveyard shift nurses got breast and other cancers than the nurses who worked day because the night shift nurses body’s could not produce the protective melatonin they others did. Dr. Vilnis E. Kubulins is a “light physicist” at John Carroll University in Ohio, who with his associates highly decorated scientists Richard Hansler, Ph.D. and Edward Carome, Ph.D., founded LowBlueLights.com which manufactures computer screen covers, mobile device covers, and special eye glasses to block out blue light. Dr. Kubulins discussed the role of beneficial blue light in daytime hours and how that same light is harming us in nighttime hours. LowBlueLights.com produces special blue light filters for laptop and computer screens, and mobile devices. They make special orange color eye glasses which you simply wear at night to block the blue, and they have developed blue-free LED light bulbs. The screens attach and detach easily, the eyeglasses can fit over prescription glasses, and each clean up quickly with soap and water. Each of their items have been thoroughly tested and proven to completely block blue which is why we endorse these doctors for their extremely high standards and who have the same ethics that Cat Faeries has. When it’s time to turn out the lights and remove the glasses you need to sleep in a completely dark room with heavy drapery as street lights emit blue and can disturb sleep. Will everything be orange when I wear my blue-blocking glasses at night? Dr. Vilnis told us that all of the colors of the spectrum come through the lenses except blue. Yellow will look yellow, red will look red, but the blue will look black or gray because you’ve blocked it out. Interestingly white will look amber because white contains all of the colors, but now it won’t contain blue. You’ll quickly get used to this just like you got used to sunglasses during the day. 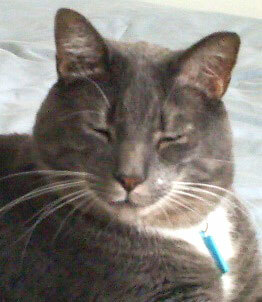 Wouldn’t it be easier for me and my cat to pop a melatonin pill? You could and your veterinarian can provide the dosage for your cat, but the tablets will not do the same as allowing your body or your cat’s body to produce melatonin imprinted with its own DNA which is far more effective and curative than a pill. It is unknown how long the melatonin from a pill would stay active in the body, but it is known that you and your cat will continually produce melatonin as long as you are not exposed to blue light at night. Your body and your cat’s body know exactly how much melatonin to produce – free of charge!